June 25, 2015 – Pikesville Rye’s heritage dates back to 1895, when it was originally distilled in Maryland, and even though the whiskey has been distilled in Kentucky since Heaven Hill acquired the brand in 1982, it remains a staple in Maryland and neighboring states. In fact, when rumors started spreading about Heaven Hill’s plans to create a new version of Pikesville Rye and distribute it nationally, the brand’s local fans pleaded with Heaven Hill to keep their original version available. While that 3-year-old, 40% ABV (80º proof) version will still be available in the Mid-Atlantic region, the new Pikesville Rye made its debut at a tasting in New York City last night. “Obviously, we wanted it to be a little bit older, but not too old…and then on the proof side, we experimented a little bit, but we already have a bottled in bond Rye with Rittenhouse,” Heaven Hill Co-Master Distiller Denny Potter said in an interview. “We already have a lot of products that are cask-strength or barrel proof, but nobody’s really done anything in between and figure out how versatile that liquid could be.” Potter was tasked with coming up with the recipe using Heaven Hill’s inventory of nearly 1.2 million barrels of whiskey, and settled on a 55% ABV (110º proof), six-year-old vatting of barrels selected from the top two floors of Heaven Hill’s warehouses. While Potter is getting much of the credit for the final whiskey, the plans were set in motion several years ago by Heaven Hill CEO Max Shapira. “We had this iconic brand that dates back from 1895 in our portfolio…it was really for many, many years just a stepchild, frankly,” Shapira said in an interview. 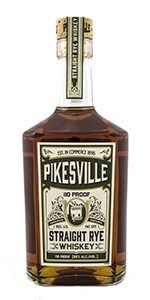 “We thought, gosh…this is a real gem going all the way back to 1895, so it has all the authenticity, the history, the heritage that you’d ever want or hope to have.” Shapiro points out that Heaven Hill never stopped producing the original version of Pikesville Rye, even when Rye whiskey was completely out of favor with consumers, and notes that publicly-traded spirits companies with shareholders and Wall Street to answer to would have quietly killed off the brand years ago. “There just wasn’t much volume, but it was iconic and we just weren’t going to do that to a brand with this kind of interesting history to it, so we hung around and stayed around with it, and fooled with it for all this time, and now the time has come for a real, live relaunch.” While Heaven Hill’s flagship Evan Williams Bourbon traces its name to 1783 and the real Evan Williams in Louisville, Shapira acknowledges Pikesville Rye may actually be the oldest brand in the company’s entire portfolio, and was one of the few whiskies produced during Prohibition (for “medicinal purposes”). Pikesville Rye will initially be available in New York City, Chicago, San Francisco, and Los Angeles this summer and later this year throughout the US in limited quantities with a recommended retail price of $49.99 (750ml).